The team that Ethiopia, Sudan and Egypt have agreed to establish to study filling of the GERD is expected to conclude the study within three months after its establishment, Minister of Water, Irrigation and Electricity said. 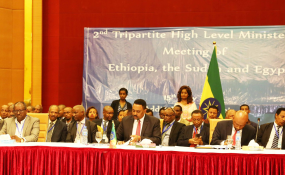 Ethiopia has proposed the idea of establishing a group that consists representatives from the three countries, as the study to be conducted by the consultant firm could take longer time. The idea has finally got acceptance and the three countries agreed last Tuesday to establish a team that consists five representatives from each country. In his presser, the Minister Dr. Engineer Sileshi Bekele said today that it was a win-win situation for the three countries as it helps them to move forward in the issue of the Grand Ethiopian Renaissance Dam (GERD). "On the establishment of a joint scientific team, we proposed to establish scientific team derived from three countries and they look deep into filling and modeling optimization just focusing on operation" he said. The agreement displayed that the three countries can narrow differences and reach consensus without the involvement of a third party, he added. According to Sileshi, the study team is expected to present alternatives on the filling of the dam and the countries will choose the one that suits to all. Ethiopia and Sudan have reservations on the inception report that the consultant firm presented, but, there was no mechanism that allows them to present queries and concerns. "On this issue of the study by the consulting company we had tertian differences and we look into these differences based on major principles looking equitable and benefit all and using also principle of not causing significant harm and generally quit we have what the leaders pretreated and signed the declaration of principles", the Minister said. However, the Tuesday's meeting has solved this problem and set a mechanism on how to present such concerns. They agreed to submit their queries and concerns to the firm jointly. The Minister said that the consensus reached on Tuesday's meeting on the key issues was a win-win situation for all the three countries.